I love that one of my jobs is to blog about crochet. How lovely! I've been blogging weekly on Crochet Spot since fall 2012 and I've amassed quite an archive of posts there. The list is arranged in backward chronological order and includes ramblings, news, round-ups, and tutorials. 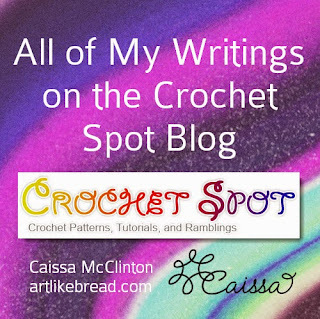 I've thoroughly enjoyed connecting with the readers at Crochet Spot. It is such a lovely forum and I feel lucky to be a part of it. I'll be updating the page on a monthly basis! Click the picture to link to my archive!